Of course, we had to eat dinner to get our strength up before taking the time to pack all this kraut in jars. We had homemade, nitrate-free sausages and haggis from the Seward Co-op here in Minneapolis, roasted sweet potatoes, fresh greens salad with homemade vinaigrette, fresh tomato salad, fresh fruit, homemade pickles, and three varieties of our kraut. It was delicious, and so nourishing on the cool December night. I was amazed to discover the I actually like haggis. You learn something new everyday, I guess. After dinner, we got to work packing and sampling. The end results was amazing! The flavors were complex, distinct, and wonderfully sour, and the texture was crisp and crunchy. The Terre Vivant was divine, and I could easily eat bowl after bowl of the red pepper, onion and garlic. There were slight flavor differences between the batches made with different salts - the Real Salt batch had a slightly wilder, earthy flavor, presumably from the presence of all those trace minerals that aren't in canning salt. The dill and caraway batches were wonderfully classic, and the "Kim's Mix" was alluring and quite fragrant. The seaweed tasted really good but had a totally slimy, weird texture - seaweed is rather slimy, and when it is fermented with cabbage it gets even more gelatinous. Sliminess aside, that batch was still a great success, and probably one of the most nutrient-packed batches we made. Amy, the keeper of the kraut and blogger at Cook 'Em if You Got 'Em, regularly burped the bags to make sure our kraut was healthy during the fermentation process. Our kraut fermented for about 6 weeks, and spent one final week on the porch to stop the fermenting process and keep them cool. Then we sampled and packed them up! 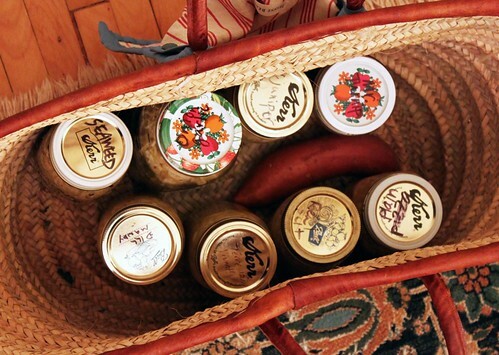 In the end, we each ended up with 8-9 jars of beautiful kraut. Amy had also made a batch of fermented grated turnip. Fermented turnip is called Sauerruben, and being the avid turnip-lover I am, I was super excited to try it. The flavor was wonderful - sour, sharp, salty, earthy. I haven't yet broken in to my jar of Sauerruben, and can't wait to eat it with some slow roasted meats and root vegetables on one of these cold winter evenings. It's one of the few jars I have left - I've already managed to eat through about half of my share of the kraut, so it is almost time that I start making more! Don't worry, there's not really blood in there.My share of the kraut! yay! I love the method of fermenting in plastic bags. I made a couple of batches on my own using this method: a wonderful kimchee and a red cabbage and fennel kraut. I loved the simplicity, and thought the end results were consistently fabulous. When you ferment in plastic bags, you need to regularly "burp" out the air that builds up - the fermentation process leads to the development of CO2, so the bags will start to blow up like a balloon. 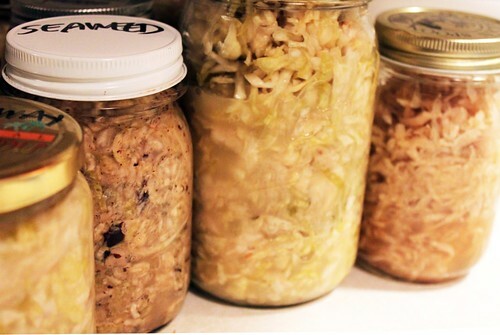 As long as you press out air - once or twice a day, depending how quickly fermentation is occurring - your kraut will not spoil, nor will it grow a layer or mold or scum. Unlike fermenting in crocks, you don't need to scrape, or worry about having a partially open crock lying about your kitchen. You also don't need to worry about cross-contamination of bacteria and yeasts between various fermening things - for example, if you have sauerkraut, kombucha, and a sourdough starter all in your kitchen at the same time, the bacteria can cross-contaminate through the air and mess each other up. When you ferment in bags, it keeps all those little bacterias and yeasties bound inside, and it won't mess up your other ferments. Pretty cool, huh? Thankfully, storing kraut is easy this time of year. Once it is in jars, you can refrigerate it, or keep it on a cool porch, or even a cool basement (around 50º will be totally fine for storage). 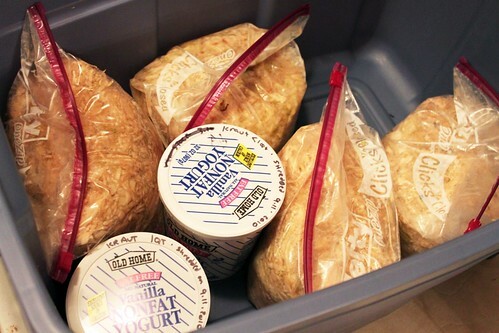 Or, you can freeze it and let it thaw in the fridge or at room temperature. You can also can it to make it shelf-stable, but cooking it kills all those enzymes and healthy bacteria. 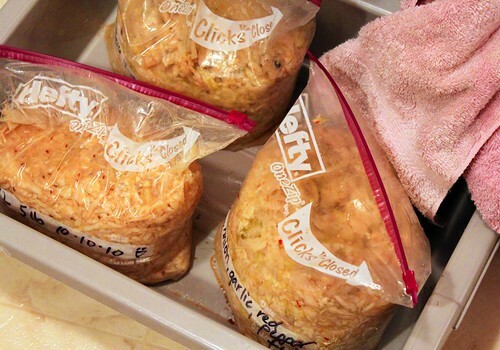 For full instructions on making kraut and fermenting in bags, check out this post. I usually make kraut in glass or ceramic, but this time we did it in plastic, per my friend's suggestion. Since the bags of kraut were being kept at amy's house, I wanted to try a few myself, to really see the fermenting process, so I made a couple batches myself. While I am happy with the results and it was SO simple to ferment in bags, I do feel a little creeped out by the plastic bags. I tend to think plastic is scary - especially since sauerkraut has a high acid content, and I wonder if that could break down plastic and release plastic toxins into the kraut. I also despise plastic waste. But wanted to try this method, adn wanted to share this option with all of you. The choice is up to you. Either way, the process for making kraut is the same - cabbage, salt, spices. The difference only lies in what kind of container it is in, and the maintenance while fermenting.